Murple - "Io Sono Murple"
Murple were one of the better, but more obscure of the Italian progressive rock bands of the early 70’s. Io Sono Murple (I Am Murple) was their one and only release, but it was a great contribution to the scene in Rome at the time. By today’s standards, it’s a fairly short album, clocking in at about 34-minutes in length, but it’s all quality music, no filler. There are just two lengthy tracks of dramatic and dynamic classic symphonic progressive rock. And while all four musicians in the band are excellent, it’s the keyboard playing of Pier Carlo Zanco that really stands out, whether he is rocking out on the Hammond organ, injecting freaky little synthesizer flourishes, or playing beautiful classical style piano. In fact, the whole band (Pino Santamaria on guitar, Mario Garbarino on bass, Duilio Sorrenti on drums, and keyboardist Zanco) finds a nice balance between the more aggressive (but always very melodic) rock parts, and the more haunting classical styled parts, making it all work together as a whole. 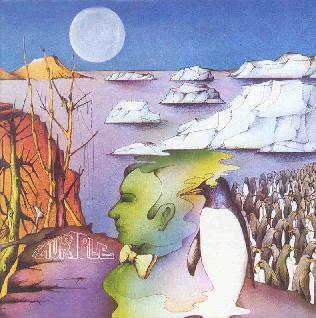 Although the lyrics are in Italian, the liner notes say that it is a concept album about a penguin that leaves his home in Antarctica, and encounters the Evil Man. This must all relate, I imagine, to a friend of the band who claimed to have discussions with an invisible penguin named Murple! Any fan of 70’s prog rock, especially the Italian variety, will certainly love this lost classic. Thanks again to Akarma for unearthing a wonderful gem.